Love this Lady!!! Vanessa is driven for fitness. She is focused on all levels, mind / body connection. Every workout is her best effort. Striving to accomplish her weaknesses, she redesigns the gym, literally. LOL. (Thanks Don) Very respected and loved at the gym, this Lady is a model of physical fitness. Privilege to have her at Pro Fit. Looking forward to her next adventures, stay tuned, they are coming!!! It was 2010 and I was working out on a semi-regular basis but had somewhat plateaued, doing the same stuff every workout. I wasn’t getting any faster/stronger/better. My daughter, Brynn, had been doing Karate with Sensei Hamid for 6 years at that time and I decided to check out a boot camp class. I thought I was in pretty good shape when I walked in but that first class, and the next few, almost killed me! I managed not to throw up & kept coming back. 2.What was going on in immediate life when you start the training at Pro Fit? I was working a lot, not eating very well and was maybe a little bit*hy occasionally (often). The workouts that I was doing had become routine and I was looking for something different. With Pro Fit I found it – never the same workout twice & always challenging. 3.Where was your fit level at start of training to now? Significantly improved! I really did think I was fairly fit when I started but there is no comparison. It’s a completely different level of fitness and definitely more well-rounded, i.e. not just strength or cardio or flexibility or speed, but all of the above. The best thing is that there are always new things to try and improve on. 4.Where is your personal level, ie. energy levels, time management levels, injuries…? I have far more energy and am way less bit*hy now (family nodding in agreement). My time management skills have improved and I am more efficient – I have to be, to make up for all that time I spend at the gym every day, lol. I have had a few injuries. Each one has been a learning experience and helped me improve my form. I definitely think that my fitness level has reduced the recovery time of each injury. Most recently, I twisted my leg skiing, resulting in a torn ACL plus possible meniscus issue (still waiting for an MRI!) but I think there is a pretty good chance, given the compensating strength of my leg muscles, that I may not need/want surgery. I have met many inspiring people and made some really great friends – that is the most rewarding part. I have learned to accept a challenge and work to achieve the desired result, both inside & outside of the gym. I never say “I can’t do that” anymore…I don’t even think it! 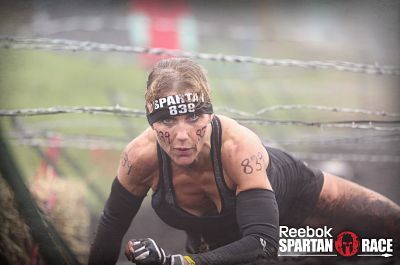 I have discovered that I really enjoy competing in races – the Spartan events, 10K’s, Seek the Peak etc. I have found patience and quiet with yoga, and improved my flexibility as an added benefit.